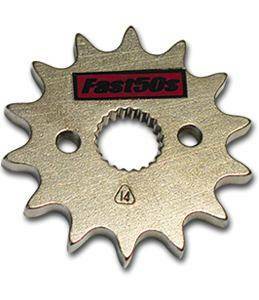 Our motorcycle sprockets are engineered using only the highest quality Steel, Aircraft aluminum 6160. Our selection of sprockets is second to none. Available sizes are 12 - 18 tooth. Select your size in "Make It Your Own." OEM / Stock Honda 50cc & 70cc size is 14 Tooth. Please note, on the 17 and 18 tooth front Sprocket a slight case mod is needed to run this sprocket size.